CHARLOTTE, N.C. (CNS) — Hundreds of people filled a spacious, brightly lit building in south Charlotte in July for an occasion years in the making: the consecration of a permanent church for the Indian Catholic community in the Queen City. 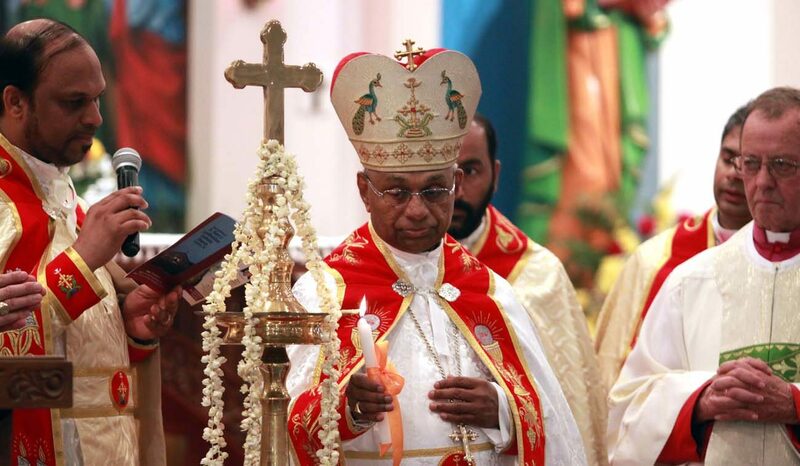 St. Mary’s Syro-Malabar Catholic Church was dedicated July 22 by Bishop Jacob Angadiath during Holy Qurbana, or Mass, celebrated mostly in the Malayalam language. It is the first permanent home for Charlotte’s Indian Catholic community –- comprised of about 45 registered families and growing –- and only the second Syro-Malabar Catholic church in North Carolina. “It’s not an easy task” to build a church, he said, smiling as he expressed gratitude to everyone from the building committee members to the choir. “Every eucharistic celebration is the greatest thanksgiving. In his homily at the July 22 Mass, Bishop Jugis noted that just as the church is consecrated to God, the growing community of Indian Catholic faithful are similarly consecrated –- and they must take what they receive in church out into the wider community. “This new church is a sign of the amazing growth of our Catholic community in this area, and we give thanks to Almighty God for this blessing –- this growth of the Catholic faithful –- and the many opportunities that the Lord therefore gives us to serve Him as our community grows,” Bishop Jugis said.